This thematic area provided an overview of demographic and geographic data on participants and non‑participants in cultural activities, and opportunities for cultural engagement 10 years after the Liverpool European Capital of Culture (ECoC), using one core research project as the foundation for these explorations. 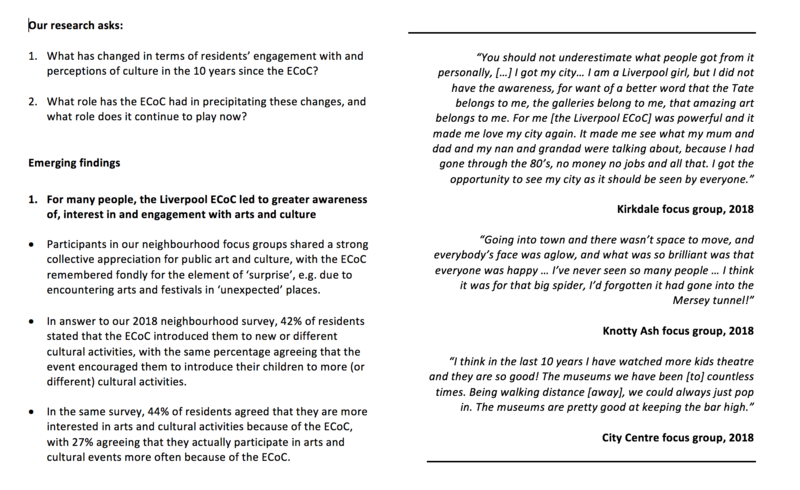 This project explored the medium-to-long-term impacts of the ECoC on cultural participation and perceptions of social change in four Liverpool neighbourhoods – City Centre, Aigburth, Kirkdale and Knotty Ash. Semi-structured interviews and focus groups that built on parallel research conducted in Liverpool over the same period. This combination of quantitative and qualitative approaches provided a holistic and nuanced exploration of residents’ participation in cultural activity, their perceptions of the neighbourhood they live in and the wider city, and their memories of the ECoC in 2008. This study is the first of its kind to examine the multiple, medium to long-term impacts of an ECoC on local cultural participation. It presented a key opportunity to gain insights into the perceived lasting effects of mega events, like the ECoC, on perceptions of the city and local residents’ cultural practices. The testimony of participants was used to frame a series of neighbourhood case studies – placing the voices of residents, and their neighbourhood narratives, at the centre of the research.